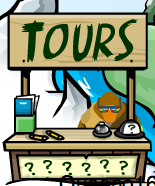 If you are 45 days old and like to help penguins head on over to the Ski Village and click on the Tour Guide Stand! 1.) Which color puffle can catch on fire? 2.) In what room can you find old copies of the Penguin times? 3.) Which of these rooms doesn’t have music playing in the background? 4.) 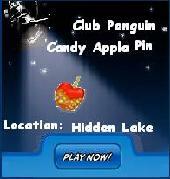 How does the pink puffle play? 5.) What item is always hidden in different place in the clothing catalog every month? 6.) How many sled racing tracks are there? 7.) Which room has a cuckoo clock? 8.) How do you get a pin? 9.) Which of these rooms does NOT have a game in it? 10.) What is the name of captain rockhoppers ship? 11.) What day does the newspaper come out? 12.) What is the name of the big fish in ice fishing? 13.) Which of these games has a shark in it? 14.) How many coins does it cost to buy a player card background? Congratulations! You are now a tour guide and get the tour guide hat! 1.) Say your own things! Don’t just use the pre-written text! People like to hear about ninjas, myths and secrets! 3.) Do some other things with the people your giving a tour to! Send them a post card! Have a snowball fight! Do some dancing! Show them a hidden room! Show them some hidden emotes! Go sledding! 4.) And last and the most important tip…Have fun!! !